This suit has been my favorite piece of clothing from the first time I put it on. It's absolutely BRILLIANT! I watched Doctor Who and really liked David Tennant's suit, but I wanted something a little different- I wanted a new suit, not a costume. And that's exactly what I got. I got the wool version in dark brown with gold stripes, and the color is perfect. The fit is absolutely flawless (which is great because I'm a little guy who's used to overly-baggy suits). It's very trim, and I like it. The half-belted back makes the suit taper beautifully. 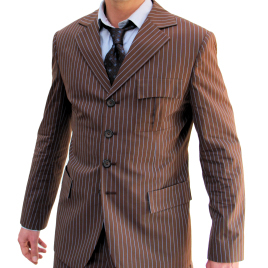 The pinstripes add a lot of character and show the suit's contours. I've gotten a lot of compliments when I've worn the suit out (to a wedding rehearsal dinner, clubbing, student government). And it does impress the Whovians who recognize it.